Uhhh, is this thing still on? Does my password still work? Whew, good. Ok, Back to business. Saturday felt like a finale to a solid second season of your new favorite TV. Not quite as magical as the first season, but still full of surprises that made you remember why you fell in love with the thing in the first place. And who could have predicted that Open Cup story arch? The will-they-won’t-they make the playoffs storyline that dominated the final act got a little tired, but we stuck with it. The emergence of new favorite characters like Djiby and Konig were great additions considering they Game of Thrones-ed their main character Okoli from the first season. That’s probably enough TV analogies for one blog. But Saturday really did feel like the end of the season. Farewells were said, handshakes and high-fives exchanged between strangers who sat or stood next to each other for the summer. It was bitter sweet in a lot of ways. The product on the field during the home finale was fantastic. Fans were treated to what was probably our best possible lineup, though with the inexplicable reappearance of De Wit. 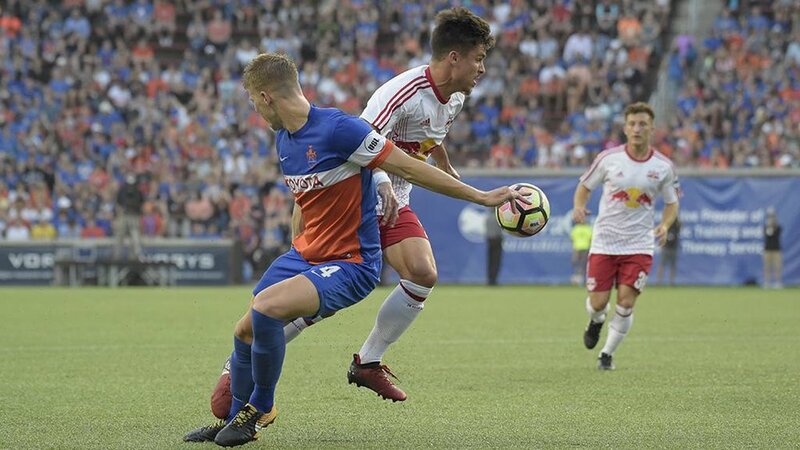 Six goals total with FC Cincinnati vanquishing their Red Bull demons was a sight to behold. There was something extra special about Kenny Walker scoring an incredible free-kick in front of the Bailey while we were singing “We’re gonna win, we’re gonna win”. Can you believe there are still people who say soccer is boring? And with that win, the season is set up nicely for the final run of games. Which is the point of this piece in the first place. This season is not over. There are still four, count them, four game left in this season! That’s twelve and half percent of the season to go! However, all of those games are on the road. Which is a bummer, because FC Cincinnati absolutely melts when the pressure of 350 people in the stands is on them. If by some miracle this team manages to win four games on the road, in a row no less, a home playoff game is not out of the question. And that is what makes this so exciting. Our club is still in a dog fight for playoff positioning and we need to support them. Remember those scenes of people crowding into bars to watch the away game in Miami? That needs to happen again. This team left everything they had out on the field on Saturday, and we owe it to them to support them on the road. Those moments of pure ecstasy in the home bar of our supporters groups are amazing. The scream and yelling and hugging and singing is awesome. Only USA World Cup matches have equaled the excitement I have felt at some of these away-game watch parties. If you have not yet been to one of this cities soccer bars during an away game, you ought to give it a shot. And maybe make a new friend or two! And it is not like you are going to be watching the Reds or Bengals makes a mockery of our city in front of the nation anyway. We need to be supporting this aspirational club in bringing home winning soccer. Saint Louis, Charlotte, Ottawa, and Tworonto are all winnable games for this team. And if nobody else in this city will let a sports fan have hope, we might as well pull for this plucky little soccer club that refuses to quit. Come on you FCC.